Other Common Names: Common ivy, true ivy, gum ivy, woodbine, winter-green, winter-grunt, kissos, bergflétta. 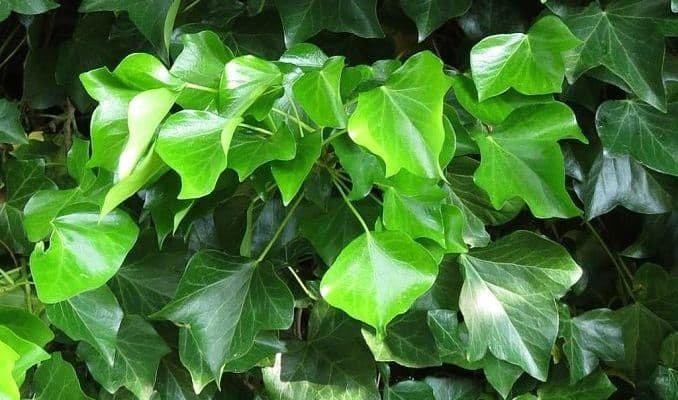 Habitat: English Ivy is a common garden plant that is native to Europe and temperate Asia. Description: English ivy is an evergreen climbing vine with glossy, angular leaves. It climbs using fibrous shoots resembling roots which grow along the length of the stem and attaches to surfaces with small disks which cling to the roughness a bark or wall where the ivy climbs. If these shoots find soil, they become true roots. The English ivy may injure trees upon which it grows by taking nutrients from the trees. At the summit of the tree or wall, the ivy will branch out in a bushy form; the leaves change from their usual five-lobed and angular leaves, becoming ovate with entire margins. The flowers only appear where the branches grow above their support and the ivy takes its branching form projecting a foot or two from the climbing stems with flowers at the end of every shoot. The flowers of English ivy are small clusters of yellowish-green nearly globular umbels. The five petals are broad and short with five stamens. There is little scent, but the flowers have abundant nectar which provides food for bees in late autumn. The black or deep purple pea-sized berries are smooth and succulent, ripening the following spring, providing birds with food. The evergreen leaves provide winter shelter for birds, and many birds prefer ivy for a nest-building site. English ivy is very hardy, withstanding frost, as well as urban smoke and the air pollution of manufacturing regions. Plant Parts Used: Leaves and berries. English ivy is a member of the ginseng family and has been used in traditional herbal medicine both in Europe and Asia since ancient times. Historically, English ivy was held in high esteem; its leaves formed the poet’s crown, as well as the wreath of Bacchus. Ivy was probably dedicated to Bacchus because it was believed that binding the brow with ivy leaves would prevent intoxication. Greek priests presented an ivy wreath to newly married couples, as a symbol of fidelity. The plant was sacred to the Druids and considered the female counterpart to the masculine holly. Together with mistletoe and holly, ivy is a traditional herb used to decorate houses for the Christmas season. Traditional folk medicine used English ivy internally for liver, spleen and gallbladder disorders, and for gout, arthritis, rheumatism and dysentery. Externally it was used for burn wounds, calluses, cellulitis, inflammations, neuralgia, parasitic disorders, ulcers, rheumatic complaints and phlebitis. English ivy is most widely used today as a natural treatment for respiratory tract congestion; it is a respiratory catarrh used for symptomatic treatment of chronic inflammatory bronchial conditions. The herb contains saponins which appear to be responsible for preventing spasms in the bronchial area. Commission E, a prestigious medical group in Germany approved ivy leaf extract as an herbal decongestant as well as treatment for inflammation-related lung (bronchial) conditions. English ivy exhibits antiviral, antimycotic, and anthelmintic and effects and some studies indicate that the leaf extract may have anti-cancer and antioxidant properties. Folk medicine used ivy leaf poultices externally as a treatment for swollen glands and chronic leg ulcers and topical decoctions have been used as a natural treatment for scabies, lice, and sunburn. Tincture: 40-50 drops daily as single doses of 5-10 drops. Tea: 1 heaped teaspoonful to 0.25 liters hot water; steep the mixture for ten minutes; tea and other infusions may be taken 3 times daily. Poultice: Mix fresh ivy leaves 1:3 with linseed meal. Infusion: 1 heaping teaspoonful to ¼ cup boiling water and steep for ten minutes. Fresh English ivy may cause mild skin irritation. If signs of an allergic reaction occur, such as a rash, itching or gastrointestinal upset, discontinue use. 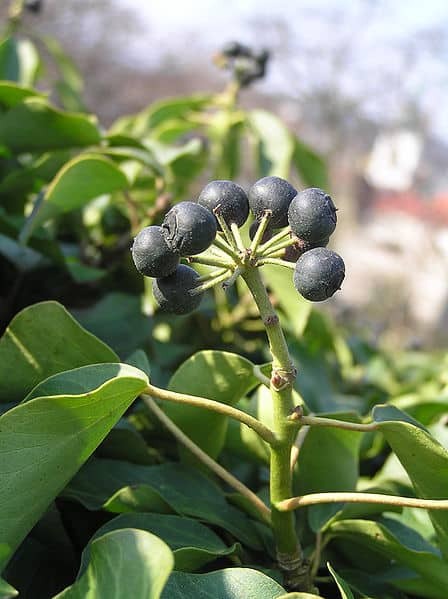 Ivy is considered to be generally free of side effects; however, if taken in high doses it may cause nausea and vomiting due to its emetine content. Ivy should be avoided during pregnancy and lactation unless otherwise directed by a qualified healthcare provider. Thanks for this. Very interesting. I actually practice Chinese herbal medicine, but was in need of an easy way to get hold of remedy for an exhausting mucus cough after a viral infection. I bought some Vogel’s Bronchoforce which contains ivy, thyme and licorice root and have already noticed a change in symptoms. So I came to your site to find a bit more about the herbs. I did the very same!! Bought Vogel’s Broncohsan, then looked for info on these herbs and found this website!! My daughter and I both suffer with bronchitis, dry throat and coughing fits every winter and have started the Vogal’s elixir in hopes to lessen our yearly breathing illnesses. We also drink Holy Basil Tea almost year round!! Human bodies are not made to accept chemical pharmaceuticals, our Creator has given freely the seed bearing plants and more to use for health and nutrition!! We also rub Pure Pine Resin Turpentine on our chest and throat in the winter months just like my parents and grandparents did!! And eat Garlic and Onions and nutrient dense Vegetables with Healthy Sprinkles of organic and homegrown and Fresh and Dried Herbs daily! And have for decades and myself most all my 60 years….. The old ways are the best ways!! If I may: I used to have a similar problem every winter with full on chest infections. It turned out to be black mold because of damp. The mold went mad after the central heating was switched on in October! 6 weeks after we moved, I stopped the asthma meds I’d been on for the 7 years we’d lived in the house. Check the house for hidden damp and mold. 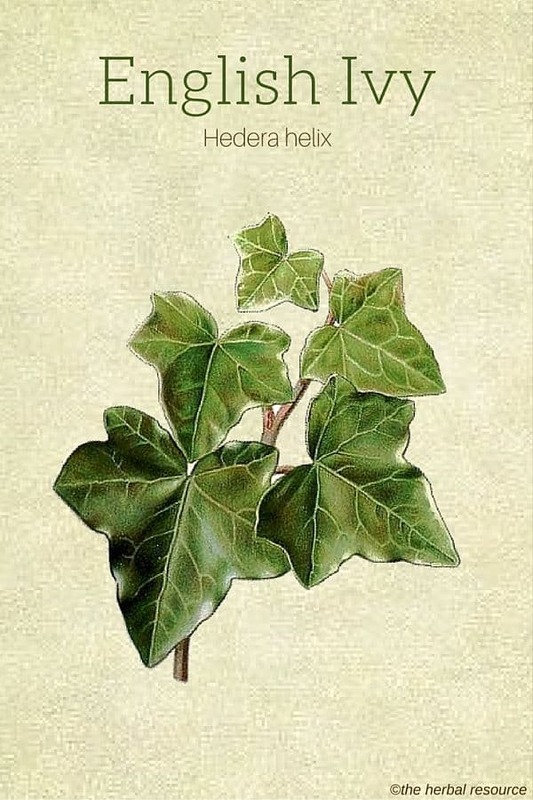 I’ve been searching for information on Hedera in herbalism and this was a great start. One thing I am still struggling with is the lack of clean distinction between English Ivy (Hedera helix) and Irish Ivy (Hedera hibernica). It seems they have a long history of being lumped together despite some core biological differences in chromosomes. “Like us humans, H. helix is diploid; its somatic cells harbor two sets of chromosomes. But H. hibernica is a tetraploid freak, with four sets of chromosomes, ” as covered in this Washington Post article. So I would love some clear information on whether they have the same medicinal properties. Any thoughts appreciated! If ivy contains saponins then it should create a mild soap when mixed with water, yes? I’m looking for a local plant that produces a gentle soap without having to dig out the two feet deep roots of Traditional soap root! Yes, you can definitely make a gentle soap from the leaves.